The digital world is full of threats, but what doesn’t kill you makes you stronger in the pages of Vertigo’s Goddess Mode. Writer Zoë Quinn has considerable experience dealing with online harassment, and she’s using it to craft a cyberpunk fantasy about women who are transformed by digital attacks to become something greater and more powerful. In the case of Goddess Mode, those attacks are more than angry messages on social media: They’re online daemons who pull unsuspecting victims into a technological landscape where their entire being is consumed. But, if you somehow survive, you become an oracle with superhuman abilities. Cassandra Price is the latest person to undergo this evolution, forcing her into an alliance with other oracles who are both permanent targets and protectors for others pulled into this deadly cyber-trap. This exclusive preview of this week’s Goddess Mode #2 shows Cassandra and her new colleagues making a daring escape from a stampede of daemons, showcasing the thrilling, vibrant visuals of artist Robbi Rodriguez and colorist Rico Renzi. The art team that made Spider-Gwen a star reunites to build a sci-fi world where they can go buckwild with design elements, layouts, and coloring, energizing Quinn’s story with vivacious imagery. The sensory overload in these pages accentuates Cassandra’s disorientation as she comes to in a strange, deadly digital landscape, and the neon palette and glitch effects separate the world of Azoth from analog reality. Letterer Simon Bowland gets a lot to work with as he differentiates between human and A.I. dialogue, and later in the issue, his lettering becomes an even more prominent visual element as he depicts how the oracles communicate when they’re separated. 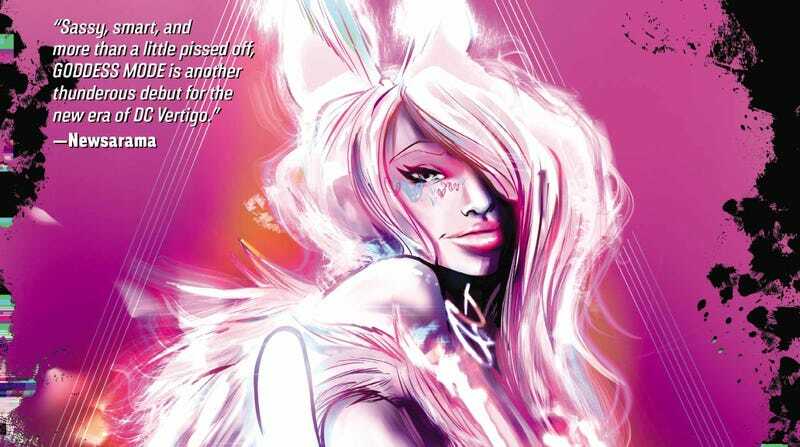 The aesthetics of Goddess Mode transport readers to a future environment full of personality, and discovering new aspects of the environment is as fun as learning more about the characters.